High Quality Content by WIKIPEDIA articles! High Quality Content by WIKIPEDIA articles! 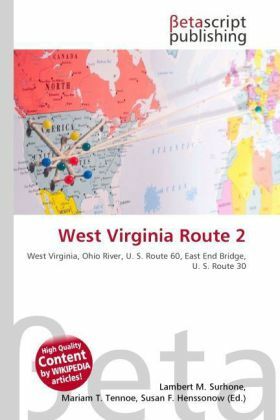 West Virginia Route 2 is a state highway in the U.S. state of West Virginia. It generally parallels the Ohio River along the west border of the state, from U.S. Route 60 in Huntington (just west of the East End Bridge) northeasterly to U.S. Route 30 in Chester (just south of the Jennings Randolph Memorial Bridge). WV 2 leaves the shores of the Ohio River in two places: between Point Pleasant and Mount Alto (where West Virginia Route 62 follows the river) and between Ravenswood and Waverly (where West Virginia Route 68 mostly follows the river).